Baron de Montesquieu (1689-1755) [pronounced mohn-tes-kee-u'] was a French writer and philosophe on political philosophy who greatly influenced the American Founding Fathers. In The Spirit of the Laws (1748) he proposed the concepts of separation of powers and checks and balances in government; these ideas were incorporated into the United States Constitution. His book, The Spirit of the Laws, explained essential aspects of good government that became enormously influential. Charles Louis de Secondat, Baron de la Brede et de Montesquieu, was born to a wealthy family of lawyers. He inherited a fortune, a title, and an important judicial office in Bordeaux. As judge for ten years he also developed his interests in philosophy, natural science, and history. In 1721 he published Persian Letters;, a satire on French institutions. Supposedly written by Persian travelers in Europe and their friends, the book was full of witty comments on French society, politics, and religion. 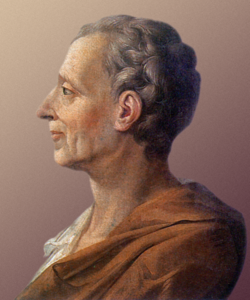 Montesquieu quickly became a leading literary figure in Paris. In 1728 he was made a member of the prestigious French Academy. He traveled widely in Europe and spent a year in England. In 1734 he published Considerations on the Causes of the Greatness of the Romans and Their Decline, emphasizing the strength of republican civic virtue as opposed to the inevitable weakness of tyranny and conquest. This book is one of the first important works dealing with the philosophy of history, and was read by intellectuals across Europe. Montesquieu greatly admired the British political system, which he considered the finest he had ever seen. The chief passion of the English is their fondness for liberty, which, he says, they "love prodigiously because this liberty is genuine." In defending their freedom, he suggests, the British are no less resolute than were the citizens of classical Rome. For liberty, England is prepared to "sacrifice its goods, its ease, its interests." In a crisis, it will "impose on itself imposts quite harsh, such as the most absolute prince would not dare make his subjects endure." Moreover, possessing as they do "a firm understanding of the necessity of submitting" to these taxes, the English are prepared to "pay them in the well-founded expectation of not having to pay more." The burden they actually shoulder is far heavier than the burden they feel. He had a strong influence on the ideas of classical liberalism (which resemble modern conservatism). Baum, John Alan. Montesquieu and Social Theory (1979) 191 pp. This page was last modified on 9 April 2019, at 12:49. This page has been accessed 26,792 times.